Afrinity Productions attended a press briefing at the Gambia Chamber of Commerce (GCCI) on Friday 26th of February 2016 at their head office. 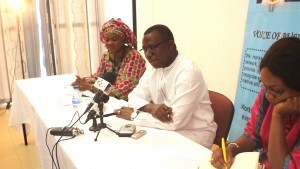 The main aim of the press briefing was to clarify the issues of the border closure between The Gambia and Senegal. 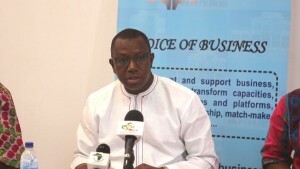 The chief executive officer of GCCI Mr Alieu Secka and his members expressed his concern over the situation as GCCI represent the voice of businesses in the Gambia. The closing of the border is affecting business both large and small, including local traders. GCCI contacted the Dakar chamber of commerce, Ziguinchor chamber of commerce and TANGO in the Gambia but still nothing is clearly confirmed. Mr Alieu Secka and the president Mr. Mohammed Jagana visited the border between the Gambia and Senegal. 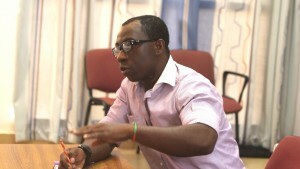 The Senegalese authorities decided to introduce processing of all the transit documentation in Dakar instead of at the border, which causes long delays at all the border posts. It can take up to seven days to get the authorization. Questions raised by different media houses like daily observer, foroyaa newspaper, eye-Africa TV , standard newspaper , point newspaper etc were answered by the Mr Aliu Secka.